Being open minded is generally a good thing. It is, in essence, being willing to accept new ideas. Having an open mind allows us to learn about the world, to enjoy new experiences, and to connect with people outside our usual sphere. All of these improve our lives or the world as a whole. It can, however, be a cop-out. Sometimes people fail to stand up for themselves and their beliefs in the name of open mindedness. If we believe in morality, or in some kind of goodness (divine or otherwise), then we believe that there are lines to be drawn. The extreme example that we often use in discussing morality is murder. Just to push these extremes: if a group of people is killing others without justification beyond enjoyment, and someone has the ability to stop them without great cost, would it be okay for that person to shrug it off and say, I'm just trying to have an open mind? I hope not. So if we accept that open mindedness is dangerous in the extreme, what about the more nuanced occurrences in our daily lives? If you suspect your friend is cheating on an exam, is accepting that behavior okay? It seems like the right first step would be to confront your friend, find out the truth, and if thy are cheating then tell them that their behavior is unacceptable—taking action in this way is the exact opposite of open-mindedness. In the religious world, this is often called righteousness, or adherence to a moral code. If morality is important, then so is standing up for morality when others violate it. This gets a little tricky, however, as certain aspects of morality are highly personal. I believe that we should each have our own moral code—rules that govern our personal behavior—and that we should righteously adhere to it. This doesn't mean that we need to proselytize our morality, but it does mean that when friends ask for advice, that we should actually give it to them according to our own morals, instead of saying what we think they want to hear. It also means that we should kindly stand up against behavior that makes us feel uncomfortable. In doing so, we have the opportunity to learn—if our morality can be improved, then this gives the other people involved a chance to respond. In fact, open mindedness is essential to this paradigm: as we consult with friends, we improve our morality. The crux of the problem is: when do we know that we are actually improving our morality, as opposed to degrading it? 2014/12/1 update Vaguely related: a NYT opinions piece entitled The Trick to Being More Virtuous. I've thought and talked a lot about startups—this shouldn't be that surprising giving my field. In doing so, I've crafted a theory for making startups successful, though I have no practical experience in testing it. We know that every startup has its core: the minimal viable product that can start getting the attention of investors or consumers. But after this core, they need to grow, or add another layer of product that builds on the core. And then they need another layer, and another...like an onion. The idea is that startups need a road map for progress. The minimum viable product is essential, but they also need to know each stage of production. As in, what comes immediately after the MVP? And what about after that? Do we waste time floundering around looking at our motley of ideas? Does each developer work on a different improvement until one takes? If your idea doesn't have multiple stages beyond the MVP, it might not have long-term value. On the other hand, the final product should be substantial, but not bloated. Make sure each layer depends on the previous one so that it's not a branching of random ideas. We are not a broccoli. In the end the goal should be to solve a single problem well, and each layer hones expands and generalizes the solution. I think that people in the startup world already know this—it's the people who are toying with the idea of doing a startup for the first time that need this perspective. For my birthday this month, we went out to an amazing dinner at The Pass. I love fixed price menus because they usually involve making fewer decisions while trying more things. I was able to try some things I had never had before: escargot (as meatballs) and foie gras. It was interesting to battle some of my instincts (snail?! liver?! yuck! ), but I was over to get over them and enjoy the meal. The very first thing that they served us was a wonderful focaccia, the likes of which I have never had before. It had a texture halfway between the typical sponge of focaccia and the open crumb of rustic breads. Its crust was also more chewy and flakey, and the shape was as if it had been cut from a tall round loaf instead of a short, rectangular one. The main meal I have no hopes of duplicating, but mimicking this bread is now a project. I started with the basic recipe in The Bread Baker's Apprentice, my favorite bread baking book. I also bought a new pack of Saf instant yeast, and hunkered down to my first attempt. I opted for baking longer under lower heat for a stronger crust, as recommended by the book. In general, it turned out a little too oily for my taste, but was a respectable focaccia. 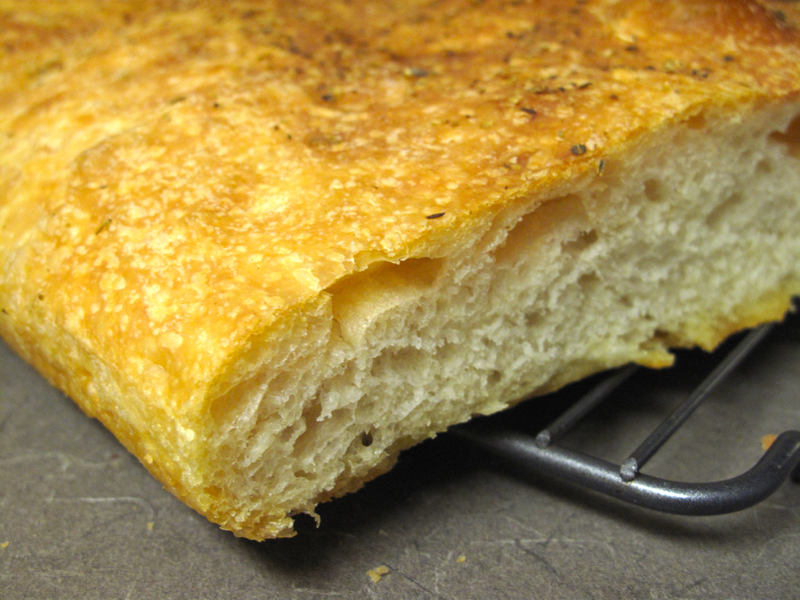 To match the Pass focaccia, it needs to have more developed gluten for an airier crumb, and the crust should be less chewy and more flakey. I may try baking a non-focaccia bread next, just to explore those other characteristics, and then combine them in a third batch. I was wondering when my kale would stop producing, and tonight I got my answer: when the plant freezes solid. We're having our last garden kale meal of the season tonight, with nature-wilted kale. After two continuous days of where the afternoon high was in the low 30s, I can't say I'm surprised.